The DL8 monitors measurement data from wastewater treated in a sewage treatment unit, such as the temperature, pH, water level, and ozone concentration, and also any abnormalities in related equipment. 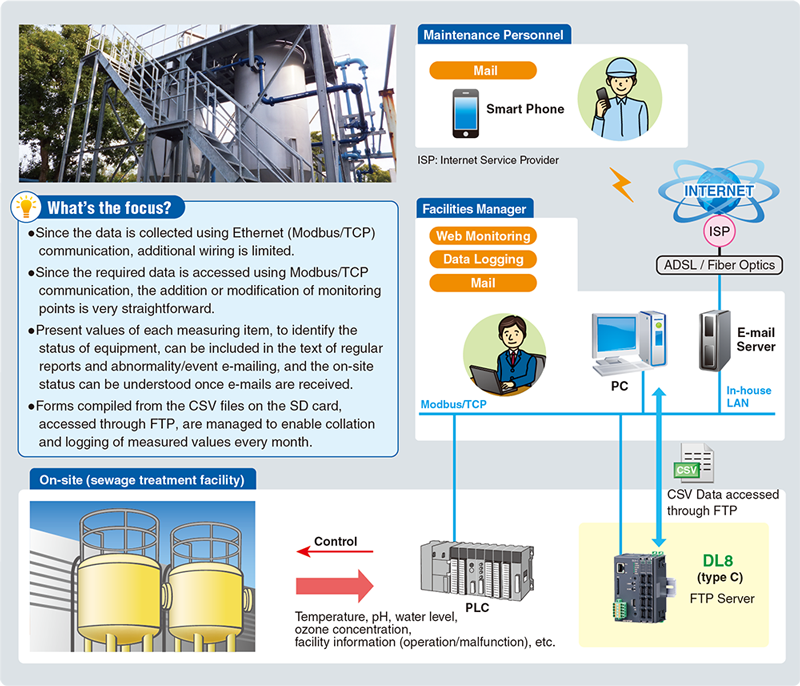 The data to be monitored is processed in advance after being imported into a PLC, and the DL8 accesses that data from the PLC using Modbus/TCP communication. Because it is connected to the in-house LAN, monitoring can be done from any arbitrary PC on the in-house LAN. As well, it sends e-mail notifications using the in-house e-mail server. The data is saved as CSV files on the SD card of the DL8 (type C), and a monthly report based on this data is created and managed using Excel. Web browsed views are images that are subject to change without notice. In order to effect the applications on this page, static IP or dynamic DNS is required. M-System Company does not provide smart phones and/or telecommunication services.